The challenge here is to "restore" the games to their original Game Boy versions using only assets from the original Red and Blue, and devamps in the style thereof. My reasons for using the original Red and Blue versions as a base is because Ruby and Sapphire are supposed to be set around the same time period. For obvious reasons, only the original Hoenn Pokédex shall feature, at least until I can figure out a way to include 386 Pokémon (which is more than the 255 Pokémon limit on unaltered GB/GBC ROMs). 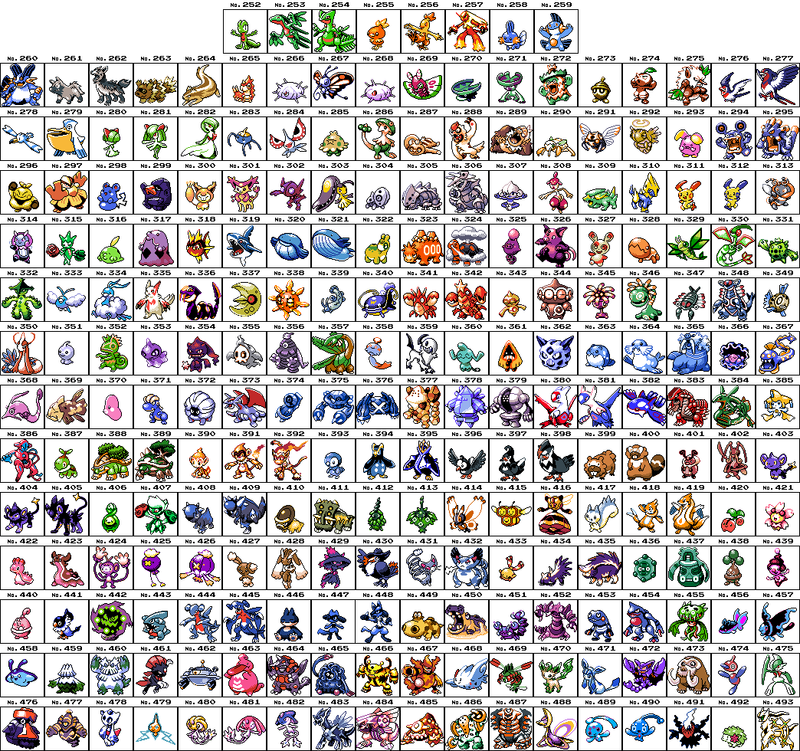 For the graphics, I'm going to need devamped sprites for each Trainer class in their Hoenn incarnations. As for the Pokémon, Red and Green-style sprites for all of them already exist, and Kanto-based Pokémon, for obvious reasons, will use their Red and Green sprites so as to blend in. 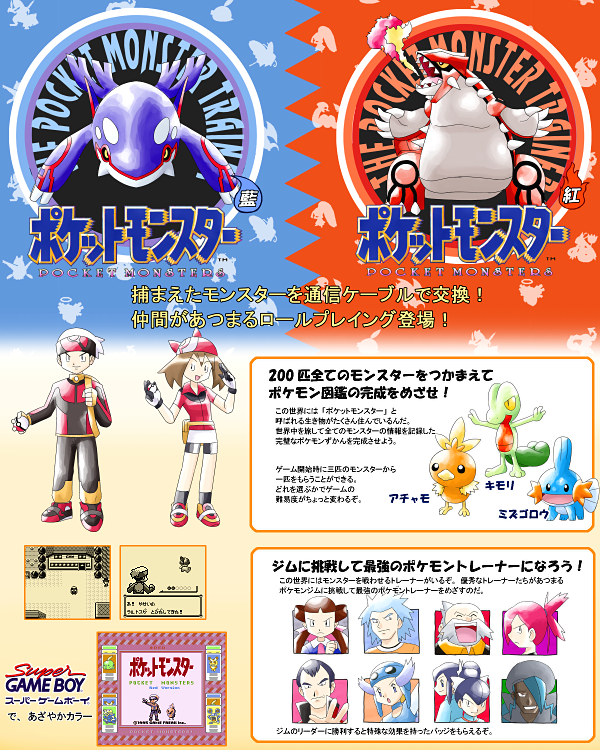 Course, backsprites for the Johto and Hoenn Pokémon will be needed, as will backsprites for Brendan, May, and Wally. Oh, and I'm not sure I'll be able to recreate the opening cinematic in any meaningful way, so I'll have to skip straight to the title screen for that. Good luck and I'll be keeping track on it! That artwork does look a bit amateurish at points even by Generation I standards, but then, that's just me looking at the redrawn characters. Anyway, I'll be doing only from Littleroot Town to Route 103 for now, just to give players a taste of what to expect. Oh, can anyone tell me where to find Gen I-style graphics for Professor Birch, Brendan, and May, and also for their respective overworld sprites and backsprites for the latter two? Because I'll be needing them for the most immediate stage of this undertaking, along with backsprites for Treecko, Torchic, Mudkip, Poochyena, Zigzagoon, Wurmple, and Wingull. For the record, I would like credit if you use those Flannery sprites. For the Pokémon, I was actually thinking of using sprites in the style of Japanese Red and Green (which already exist) or Japanese Blue/International Red and Blue as the front sprites. But these do look pretty neat (though I was planning to use smaller backsprites, in keeping with the Gen I style). 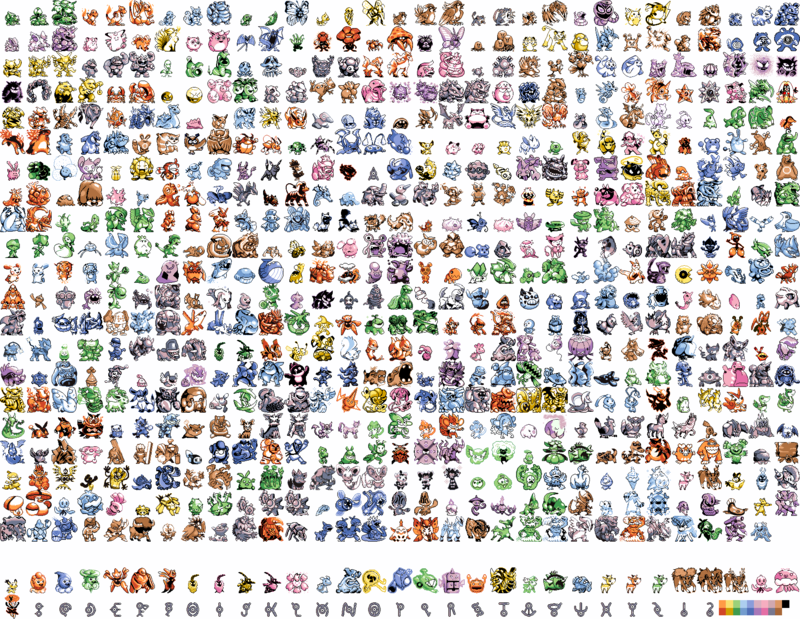 And I do intend to put the Pokémon front sprites in the Yellow folder in the project's Pics folder. ETA: Oh, Mateo, I do intend to credit you for the Flannery sprites. As for Brendan's sprite, I was thinking of using most of the images from the fourth link from the top of Rangi's post (I don't know who made those devamps, though). I think that Grovyle backsprite is good, at least. I'm sure it doesn't need to be said but feel free to use my Hoenn music for your hack, assuming you're willing to port the Gen 2 audio engine to Gen 1 and aren't planning on just using the sounds available in vanilla Gen 1 for the hack's music; if there's anything you need musically that would be high-priority let me know, I have a bit of a backlog but once I finish that it'll be good to know what I can help you with. Regarding early game I already have covers for Littleroot, Oldale, and Route 101. Your backsprites do look pretty good for Gen I-style, which generally aren't supposed to look great. One note: do try to use the preexisting Red/Green-style sprites as sources for the backsprites, because that's generally the way it was in Gen I.
Oh, when we get to that point, could you do a Blue-style sprite for Marill with it in the same pose as the Blue-style sprite for Pikachu? 1. Can you devamp Pokémon cries? 2. Is there any method of translating music code from Gen 2 to Gen 1? Never tried it, I'm unfamiliar with how it works. Definitely, I see Gen 1 hacks with Gen 2 music all the time. It would probably be easier to just start with the Gen 2 graphics and music patch. I know you aren't wanting to use GSC style sprites but those don't matter since you'd be replacing them regardless of the base. I say that because that base has Crystal's audio engine ported to Gen 1, so you can just use the Pokecrystal code of the songs as-is, and of course it would have the other improvements like the EXP Bar, Caught icon, and trainers having individual palettes and whatnot. I may be setting up a Discord chat and a repo for this project soon. I'll leave links on the opening post as that happens. Well with that note I'll be sure to take another try. Probably take me five minutes but I won't get a chance to try till tomorrow as I'm out and about today. Great! Do take note that there are a few differences between Pikachu's Blue sprite and Marill's Gold sprite--namely, in his Blue sprite Pikachu's mouth is closed and he's got his right foot raised outward, and Marill is looking a bit upward in his Gold sprite. It could take a while for it to fully form, but I've just started the Discord chat. It's just a basic edit on the Pikachu but a start. Any suggestions on where you'd like it to go from there? I'd start by suggesting you make Marill's body a bit rounder. Also close his mouth and narrow it a bit. Oh, and remove those effect lines surrounding Marill (I don't know what they're called, but those blue lines exploding outward are a bit redundant at this stage). I'm actually not sure how to individually add people. However, I did send you a friend request. Also... I noticed the Discord link was broken, so I just now fixed it. I've already done some work on narrowing and repositioning the mouth, I'll close it too. Of course I will be making it rounder. As for the effect I think they're suppose to be sparks? I was going to suggest maybe turning them in to water droplets but happy to remove them altogether. Actually, could you show me a version with water droplets and a version without water droplets, so I can decide which looks better? That's not a problem, I'll do a quick edit to show the water droplets (and the smaller mouth) tomorrow, it's 2am here so it'll have to wait till morning. After I'll begin the rest of the edits. It looks like it should be a nice base to work with so it'll probably be finished (barring any extra edits you ask for) tomorrow too. It's still a work in progress, but the Github repo is now up. I'll try to import and edit each requisite file as I have the time, but keep in mind I'll be working on the TCNS, my other major pokered-based project, at the same time. Oh, FroggestSpirit, I would love that very much.